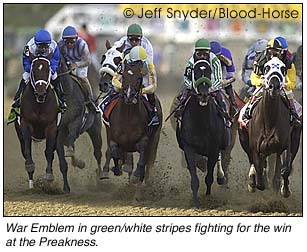 Let start off with the Triple Crown Pimlico was jumping for the possibility of a win by War Emblem, and yes it has happened, so next stop is Belmont for the BIG Triple Crow win .... Nikon's NPS was on hand with loaners and repairs, which was a huge help, except for the poor shooter whose remote got dragged down the track by he tractors grating the track between races. So when you rig your remotes, make sure they are behind the rails! Nikon's $500 Instant Rebate on the D1H and D1X cameras will continue through June 30th.....Take advantage now and save some $$$....The Nikon Lens mail in rebate will also expire on June 30th, and many of the popular lenses are part of this program....Coolscan 8000ED scanners are here and in stock for all of your multi-format scanning needs Coolpix 5000 and Coolpix 2500's are here too for your upcoming Father's Day gifts (hint hint). 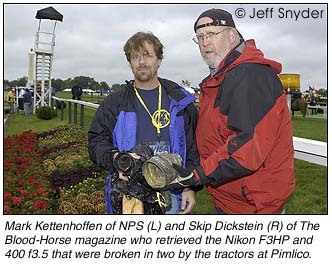 Don't forget Nikon's trade in program on the original D1's.....Trade in your original D1 towards a D1H or D1X and you can get "up to" $1200 in trade value. Call me with any questions on this program. Photo-Fax is a great way to buy and sell used gear take a look: http://www.photo-fax.com.If you have any questions at all regarding Photo-Fax, please contact Mike Phillips here in my office at mphillips@penncamera.com. 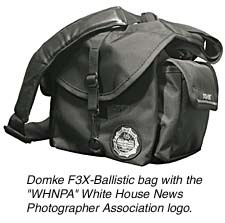 We have a limited supply of the Domke F3X-Ballistic bags with the "WHNPA" White House News Photographer Association logo embroidered on the front. They are also supplied with a leather padded strap and a WHNPA luggage tag....These are not available anywhere but here and the SPECIAL SPORTS SHOOTER PRICE IS $65...Email or call me for these. LEXAR - NEW Lexar 512mb 12X High Speed at a very very special LOW price...available soon CALL ME Lexar's "Image Recovery" program is now available to users of multiple Lexar Cards . Coming soon: a special on 1GB Compact Flash Cards in 10+ quantities. Contact me for all details. Also, I do have some Refurbished Nikon D1's with a Nikon 90 Day Warranty.... prices range from $1795 to $1995 depending on the cosmetic condition. They are all in fine working order and also come with a Battery and Charger.